What was known? 1. TC are used extensively by dermatologists for various dermatoses. 2. Clinical efficacy and adverse effects of TC vary according to potency of the molecule, vehicle used, site and duration of application, and the age of a patient. 3. Various modifications in the structure of TC molecule have been done to increase the potency which usually also increases the adverse effect profile. 4. They have well-known adverse effects, mostly local. The topical corticosteroids (TC) are among the most commonly prescribed medication in an out-patient dermatology setting since they were first introduced in early 1950s. ,, Probably no other group of drugs has had such a profound impact on the speciality as TC. Using them, it has become so much easier to treat several dermatoses which otherwise were the cause of significant morbidity among people. However, over the years it has become increasingly apparent that TC are being abused by doctors and patients alike. Apart from the well-known indications such as psoriasis, atopic dermatitis, vitiligo, lichen planus, lichen simplex chronicus, discoid lupus erythematosus, etc., they are being used for conditions such as melasma, urticaria, and even undiagnosed skin rash by dermatologists and general physicians. This is because of the quick amelioration of signs and symptoms of many skin disorders by the application of TC in the first instance. This can buy time and hold patient a while longer more so with a nonspecialist. Studies in patients presenting with steroid-related eruptions have shown that there are several nonmedical advisers like friends, neighbors, beauticians, barbers, etc. telling them to use it as fairness/cosmetic creams,  anti-acne, anti-fungal therapy and for that matter any skin eruptions. There is a tendency to reuse old prescription for a recurrent or new rash. Prescription sharing with relatives and friends on the presumption that similar looking skin problems can be self-treated by simple prescription copying is rampant. To compound this problem, there is easy availability of these drugs almost for the asking without a valid prescription at every chemist shop. Moreover, store pharmacists also double up as doctors doling out advice about which TC to use. These instances, although reported from many places worldwide, ,, have significant impact in our country of a billion plus people with an adverse specialist-to-patient ratio. The awareness of this significant problem has led to a flurry of activity as evidenced by discussions about TC misuse by dermatologists at various forums in the country and abroad. ,,, Presently, the hope is to contain, if not entirely, reverse TC misuse due to the prevailing situation in our country. As a dermatologist, the onus of responsibility lies on us, for whom these drugs are a strong weapon to fight many skin diseases, to correctly educate the society including our non-dermatologist medical fraternity about ethical and rational use of TC. It is good to recall the Biologist Van Rensselaer Potter who proposed the term "bioethics" in 1970,  to encompass a field that lay at the intersection of ethics and the biological sciences in general. The primary goal underlying all ethical issues in health care, in our case the use of TC, is to see that the knowledge gained through research should benefit and not cause harm to the society and that knowledge should be disseminated correctly. The TC are effective for skin conditions that are characterized by hyper-proliferation, inflammation, and immunologic involvement. They are also widely used in the treatment of vesiculo-erosive diseases of the oral mucosa to reduce pain and inflammation. They can provide symptomatic relief for burning and pruritic lesions. Many dermatoses are treated with TC [Table 1], but evidence of effectiveness has been established only for a small number of conditions. It is important to prescribe TC only after having a correct diagnosis in a patient and for those dermatoses where there is reasonable evidence of efficacy. We should strongly resist the temptation to use TC for everything that we do not understand or where nothing else is working. This may provide temporary benefits, but makes diagnosis even more difficult for the next time apart from exposing the patient to the risk of adverse effects. Knowing the correct indication, different strengths of topical steroids may be used to treat different phases of the disease. TC are divided into four groups according to their potency in keeping with the British National Formulary (BNF), while American system classifies them into seven classes,  with class I being the super potent or ultra potent and class VII represent the least potent [Table 2]. Although a thorough knowledge of drugs in each class may be ideal, practically a physician should become familiar with one or two agents in each category of potency to safely and effectively treat steroid-responsive skin conditions. Lotion and gels are the least greasy and occlusive of all topical steroid vehicles. Lotions are useful for hairy areas because they penetrate easily and leave little residue. Gel dry quickly and can be applied on the scalp or other hairy areas as they do not cause matting. , Foams and mousses and shampoo are effective vehicle for delivering steroid to the scalp but are costly. Occlusion increases steroid penetration and can be used in combination with all vehicle. Simple plastic dressing results in a seven-fold increase in steroid penetration compared with dry skin. However irritation, folliculitis and infection can develop rapidly from occlusive dressings and patients should be counseled to monitor the treatment site closely. Applying a topical steroid after a shower or bath improves its effectiveness due to hydration. Flexural areas such as groin, axillae, infra-mammary are self-occlusive where vehicles such as ointments should be avoided. Sometime the most well-meaning dermatologist and other medical care givers fail to spend enough time with the patient. All of us come across instances when vastly different clinical efficacy and/or adverse effect profile is seen for the same TC given for similar indication in two different patients. This is because without proper guidance, patients differ greatly in the way they would use TC in terms of the amount, the frequency, and duration of use thus causing differences in the efficacy and the harm profile they experience. Rational use involves putting across proper guidelines in this area. The use of FTU is greatly promoted worldwide to reduce the variation in uses of TC and to encourage adherence to therapy. The recommended doses in terms of FTU will depend on which part of the body is being treated. This is because the skin is thinner in certain parts of the body and more sensitive to the effects of TC. 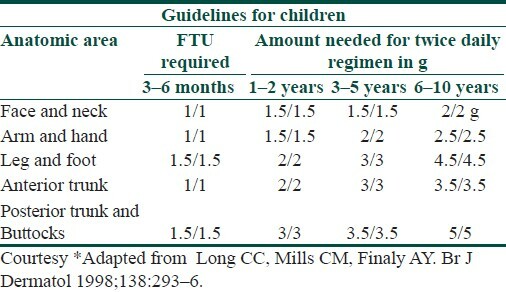 [Table 3] and [Table 4] show guidelines as to the amount of ointment needed in adult and children, respectively, based on specific anatomic areas. It is also a well known fact that the stratum corneum acts as a reservoir for TC. An ultra-potent TC such as clobetasol propionate 0.05% cream was found to persist in stratum corneum till day four. Due to this cumulative depot effect, an alternate or even twice a week application of TC can be advocated. Once a condition is in remission or under desired control weekend TC separated by weekdays of emollients or steroid sparing agents also is quite rewarding. By doing so, the benefits of the therapy can be maximized, the cost can be reduced, and local and systemic adverse effects of TC can be decreased. , All these factors will improve the patient compliance. For an individual patient, the optimal dosing schedule can be determined by trial and error, titrating to the minimum frequency of application that still provides relief. TC are used primarily for their anti-inflammatory properties. Paradoxically, the same mechanisms which mediate their anti-inflammatory properties and underlie their usefulness are also responsible for their adverse effects. 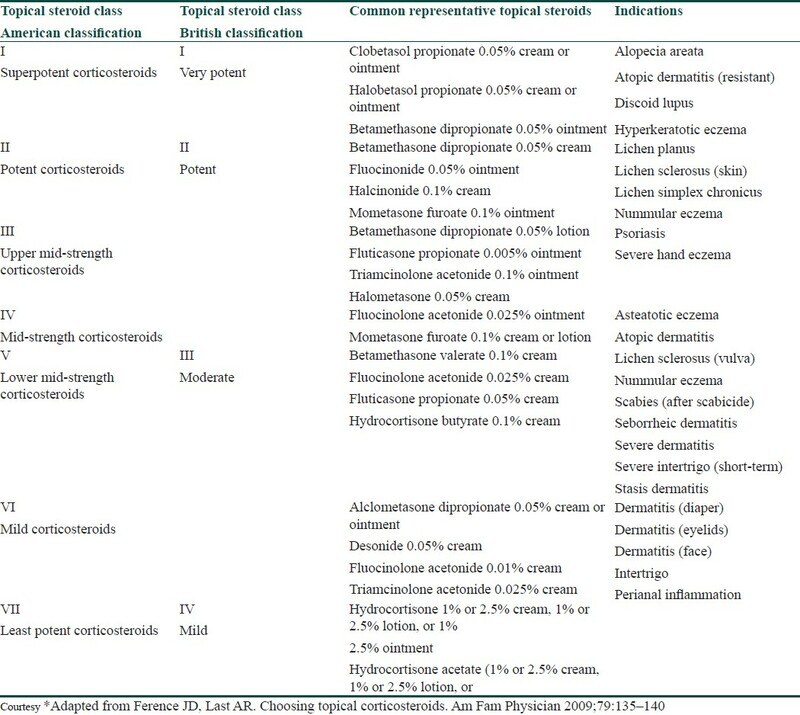 Besides the cutaneous and systemic adverse effects [Table 5], the phenomenon of steroid addiction, tachyphylaxis, and contact dermatitis (CD) due to TC also needs to be borne in mind. They are encountered more frequently and have become more prevalent with the introduction of high potency TC. These side effects depend on potency of steroid, duration of use (i.e. extended period), volume of the product applied (i.e. excessive amount), site of application, age of the patient and occlusion (if present). These include, atrophy, striae, telengiectasis, purpura, hypo-pigmentation, acneiform eruptions, rosacea-like perioral and periorbital dermatitis, and hypertrichosis. ,,,,,,,,,,,,,,, The normal presentation of superficial infections can be altered when TC are inappropriately used to treat bacterial or fungal infections. A typical example of this is seen when someone applies a TC to an itchy groin rash. If this is a fungal infection, the rash gets redder, itchier, and spread more extensively than a typical fungal infection. 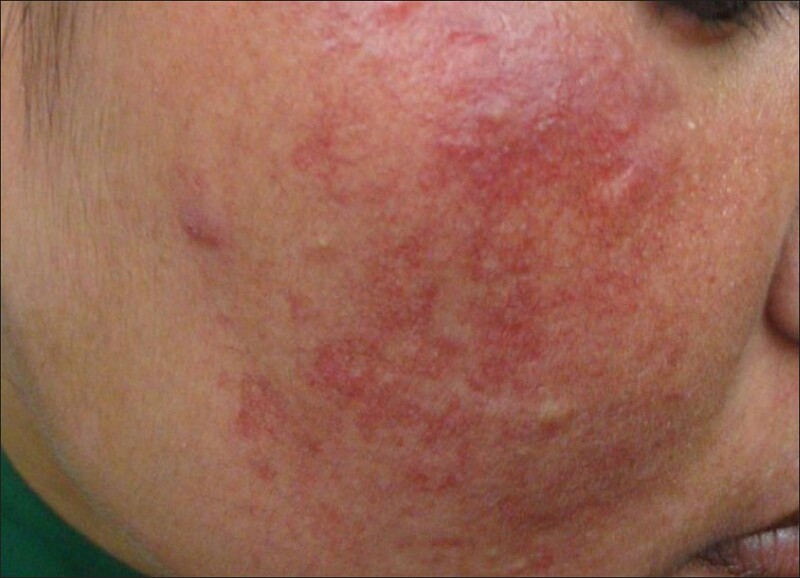 The resulting rash is a bizarre pattern of widespread inflammation with pustules called tinea incognito [Figure 1]. Due to inappropriate and uncontrolled use of TC, an under reported and under stressed entity has evolved, namely TC addiction. Convincing arguments have been put to consider several erythema syndromes such as red face syndrome, post-peel erythema, red scrotal syndrome, vulvodynia, perianal atrophoderma, chronic actinic dermatitis, and chronic recalcitrant eczemas under the umbrella of steroid addiction. , Prolonged and continuous uses of TC on face lead to the development of dermatoses which has been named variously by different workers. In our scenario, it is called "topical corticosteroid-induced rosacea-like dermatitis" (TCIRD)  or "topical steroid-dependent face" (TSDF). This has a distinct clinical presentation. Patients are mostly females who keep on using the steroidal cream till they get magical response and continue it later to prevent rebound flare till finally the lesions become persistent [Figure 2]. It is now suggested that either poor patient compliance or the natural course of disease activity (unrelated to the therapy) may be the main reason behind tachyphylaxis. Contact dermatitis due to TC is not uncommon. The estimated prevalence was found to be in the range of 0.2-6% in previous studies. ,,,,, Nonfluorinated corticosteroids are more likely to cause CD. It should be considered whenever there is no satisfactory resolution, or worsening of lesions after excluding exacerbation of an undiagnosed infection. 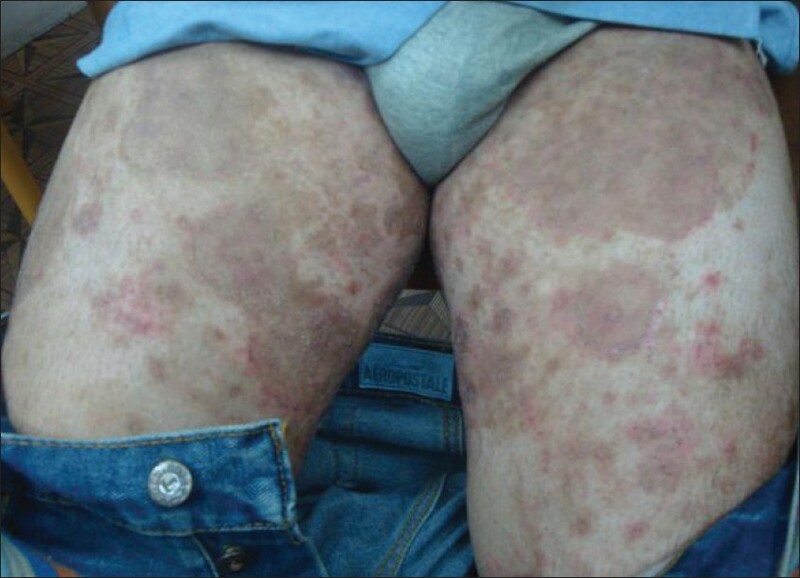 Sometimes worsening of a longstanding chronic expanding eczematous rash despite TC use may be due to the phenomenon of corticosteroid addiction, a well-defined entity which may be mediated by an underlying increase in serum nitric oxide levels. It is worthwhile to know whether there is true sensitivity to the TC itself or to one of the constituents or preservatives present in the vehicle. A skin patch test can be used to detect and confirm sensitivity to corticosteroids. TC have to be used with caution in children and elderly due to larger surface area to body weight ratio and poor skin barrier function in the former and skin fragility in the latter, respectively. Female patients are more prone to steroid adverse effects due to their tendency to use TC indiscriminately. Since there are no well-controlled studies of the teratogenic potential of most of the TC in pregnancy, they are categorized as pregnancy category C and thus recommended to be used only if the potential benefit justifies the potential risk to the fetus. During lactation, they are to be used with caution. It is known that peer pressure, rapid feel good effect, and ignorance about harmful effects of TC also lead to continuation of treatment beyond prescribed time. Time spent in educating on these points will prevent mishaps. It will also take care of the other extreme of excessive fear of using TC which leads to inadequate usage and poor clinical results. In normal healthy skin, absorption of TC varies from region to region. Penetration varies between the eyelids and the sole by nearly 300 folds. In diseased states, due to defective epidermal barrier, the penetration of TC can be two to ten folds higher. Areas with thick stratum corneum, such as palms and soles need to be treated with high potency preparations. , Conversely, areas with thin stratum corneum such as eye lid or areas of occlusion like groin and axilla and other intertrigenous areas need to be treated with medium to low potency preparations. ,, In the flexural areas, as mentioned before there will be the additional physical effect of occlusion by skin folds that will also enhance absorption. When large surface areas are involved, treatment with a low to medium potency preparation is needed because of the increased risk of systemic absorption. Monitoring of all these variables is constantly required for treatment with TC to be safe and effective. We will quickly realize that despite the best efforts undertaken at our level, many of these problems will continue to persist because they were not contributed by us alone. To address them, interventions have to be multidimensional, involving political, educational and legal approaches. Opportunity may have to be seized by the leadership of Indian Association of Dermatologists, Venereologists and Leprologists at every available forum. Political leaders and government officials should be repeatedly apprised of the prevailing situation and the need to curb this menace. Use of media for public education on topical steroid misuse is warranted, and the involvement of general practitioners, nurses. and pharmacists is needed. The legal approach should include the enforcement of the existing legislation related to the control of these drugs, so that TC are not sold without proper prescriptions. Pharmaceutical companies should be made to ensure proper labeling of TC products which should include inserts containing clear "finger tip unit" instruction, preferably with images and chart to show the numbers of unit required for specific areas of the body. This will greatly help in optimal and safe use of TC. The legal aspect should also include measures aimed at strengthening the ethical responsibilities of pharmacists in correctly advising patients about the safety of medicines bought over the counter. Once the measures are in place and working, we hopefully may see the beginning of the reversal of the misuse/abuse of TC and the consolidation of the well-established benefits of this wonderful group of drugs. To prescribe for the appropriate dermatoses. To use appropriate potency and strength of TC to achieve disease control. To maintain with a less potent preparation or reduce frequency of application after satisfactory response. To taper off the treatment upon complete remission of skin diseases. To be extra careful when prescribing topical steroid over certain locations (e.g. scrotum, face, and flexures). To be especially considerate when prescribing to the elderly and children. To be aware of the adverse effects and act immediately to counteract them. To avoid home-made dilutions of TC and prescribing TC in combination with antimicrobial and antifungal. To resist temptation to use TC for an undiagnosed rash; this makes the possibility of correct diagnosis even bleaker in the future. 1. Stern R. The pattern of topical corticosteroid prescribing in the United States 1989-1991. J Am Acad Dermatol 1996;35:183-96. 2. Sulzberger MB, Witten VH. The effect of topically applied compound F in selected dermatoses. J Invest Dermatol 1952;19:101-2. 4. Ference JD, Last AR. Choosing Topical Corticosteroids. Am Fam Physician 2009;79:135-40. 5. Rathi S. Abuse of topical steroid as cosmetic cream: A social background of steroid dermatitis. Indian J Dermatol 2006;51:154-5. 6. Bhat YJ, Manzoor S, Qayoom S. Steroid - induced rosacea: A clinical study of 200 patients. Indian J Dermatol 2011;56:30-2. 7. Al-Dhalimi MA, Aljawahiri N. Misuse of topical corticosteroids: A clinical study from an Iraqi hospital. East Mediterr Health J 2006:12:847-52. 8. Solomon BA, Glass AT, Rabbin PE. Tinea incognito and "over the-counter" potent topical steroids. Cutis 1996;58:295-6. 9. Malangu N, Ogunbanjo G. Predictors of topical steroid misuse among patrons of pharmacies in Pretoria. SA Fam Pract 2006;48:14. 10. Rathi SK, Kumrah L. Topical corticosteroid-induced rosacea-like dermatitis: A clinical study of 110 cases. Indian J Dermatol Venereol Leprol 2011;77:42-6. 11. Saraswat A, Lahiri K, Chatterjee M, Barua S, Coondoo A, Mittal A, et al. Topical corticosteroid abuse on the face: A prospective, multicentre study of dermatology outpatients. Indian J Dermatol Venereol Leprol 2011;77:160-6. 12. Chen AY, Zirwas MJ. Steroid- induced rosacealike dermatitis: Case report and review of the literature. Cutis 2009;83:198-204. 13. Potter VR. Bio-ethics. Bridge to the future. Englewood Cliffs, New Jersey: Prentice-Hall; 1971. 14. Giannotti B. Current treatment guidelines for topical corticosteroids. Drugs 1988;36 (Supp 5):9-14. 15. Gonzalez-Moles MA, Scully C. Vesiculo-erosive oral mucosal disease management with topical corticosteroids: (1) fundamental principles and specific agents available. J Dent Res 2005;84:294-301. 16. Drake LA, Dinehart SM, Farmer ER, Goltz RW, Graham GF, Hordinsky MK, et al. Guidelines of care for the use of topical glucocorticosteroids. J Am Acad Dermatol 1996;35:615-9. 17. Mc Kenzie AW, Stoughton RB. Method for comparing percutaneous absorption of steroids. Arch Dermatol 1962;86:608-10. 18. Goa KL. Clinical pharmacology and pharmacokinetic properties of topically applied corticosteroids. A review. Drugs 1988;36(Suppl 5):51-61. 19. Mckenzie AW. Comparison of steroids by vasoconstriction. Br J Dermatol 1966;78:182-3. 20. Olsen EA. A double-blind controlled comparison of generic and trade-name topical steroids using the vasoconstriction assay. Arch Dermatol 1991;127:197-201. 21. Epstein NN, Epstein WI, Epstein JH. Atrophic striae in patients with inguinal intertrigo. Arch Dermatol 1963;87:450-5. 22. Mukhopadhyay AK, Baghel V. A study to evaluate the efficacy and safety of hydrocortisone aceponate 0.127% lipophilic cream in steroid responsive dermatoses in Indian patients. Indian J Dermatol Venereol Leprol 2010;76:591. 23. Jacob SE, Steele T. Corticosteroid classes: A quick reference guide including patch test substance and cross-reactivity. J Am Acad Dermatol 2006;54:723-7. 24. Geraci AC, Crane JS, Cunha BA. Topical steroids: Dosing forms and general consideration. Hosp Pharm 1991;26:699-719. 25. Lee NP, Arriola ER. Topical corticosteroids. Back to basics. West J Med 1999;171:351-3. 26. Sheman. AJ. Proper use of topical corticosteroids. In: Frankel DH. Field guide to clinical dermatology. 2nd ed. New Jersey: LWW; 2006. p. 3. 27. Maibach HI. In vivo percutaneous penetration of corticosteroids in man and unresolved problems in the efficacy. Dermatologica 1976;152 (Suppl 1):11-25. 28. Pariser DM. Topical steroids: A guide for use in the elderly patients. Geriatric 1991;46:51-4, 57-60, 63. 29. Long CC, Finlay AY. The finger-tip unit-a new practical measure. Clin Exp Dermatol 1991;16:444-7. 30. Tadicherla S, Ross K, Shenefelt PD, Fenske NA. 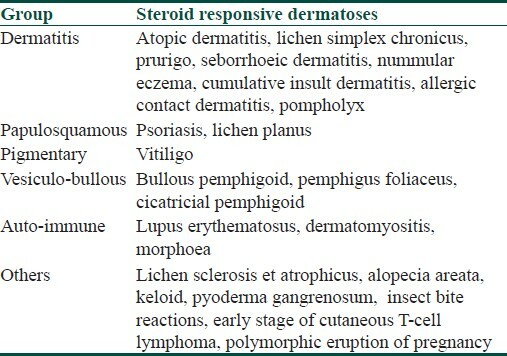 Topical corticosteroids in dermatology. J Drugs Dermatol 2009;8:1093-105. 31. Brazzini B, Pimpinelli N. New and established topical corticosteroids in dermatology: Clinical pharmacology and therapeutic use. Am J Clin Dermatol 2002;3:47-58. 32. du Vivier A. Tachyphylaxis to topically applied steroids. Arch Dermatol 1976;112:1245-8. 33. NICE Appraisal consultation document of application of topical corticosteroids for atopic eczema. National Institute for Health and Clinical Excellence. 2004 (www.nice.org.uk TA081guidance). 34. Williams Hywel C. Established corticosteroid creams should be applied only once daily in patients with atopic eczema. BMJ 2007;334:1272. 35. Abidi A, Ahmad F, Singh SK, Kumar A. Study of reservoir effect of clobetasol propionate cream in an experimental animal model using histamine-induced wheal suppression test. Indian J Dermatol 2010;55:329-33. 36. Lagos B, Mibach H. Frequency of application of topical corticosteroids: An overview. Br J Dermatol 1998;139:763-6. 37. Bodor N. Design of novel soft corticosteroids. Curr Probl Dermatol 1993;21:11-9. 38. Hengge UR, Ruzicka T, Schwartz RA, Cork MJ. Adverse effects of topical glucocorticosteroids. J Am Acad Dermatol 2006;54:1-15. 39. Dahl MGC. Hazards of topical steroid therapy. Adverse Drug Reaction Bull 1985;115:428-31. 40. Nelson NV, Sorensen PN. Glaucoma induced by application of corticosteroids to the priorbital region. Arch Dermatol 1978;114:953-4. 41. Goetta DK, Odom RB. Adverse effects of corticosteroids. Cutis 1979;23:477-87. 42. Ammar NM, Rao B, Schwartz RA, Janniger CK. Adolescent striae. Cutis 2000;65:69-70. 43. Nigam PK. Striae cutis distensae. Int J Dermatol 1989;28:426-8. 44. Hettmannsperger U, Tenorio S, Orfanos CE, Detmar M. Corticosteoroids induce proliferation but do not influence TNF or IL-1 beta-induced ICAM-1 expression of human dermal microvascular endothelial cells in vitro. Arch Dermatol Res 1993;285:347-51. 45. Rapaport MJ, Rapaport V. Eyelid dermatitis to red face syndrome to cure: Clinical experience in 100 cases. J Am Acad Dermatol 1999;41(3 Pt 1):435-42. 46. Piewig G, Kligman AM. Induction of acne by topical steroids. Arch Dermatol Forsch 1973;247:29-52. 47. Fisher D. Adverse effects of topical corticosteroid use. West J Med 1995;162:123-6. 48. Kaidbey KH, Kligman AM. The pathogenesis of topical steroid acne. J Invest Dermatol 1974;62:31-6. 49. Litt JZ. Steroid-induced rosacea. Am Fam Physician 1993;48:67-71. 50. Mehan R, Ayers S. Perioral dermatitis. Arch Dermatol 1964;89:803. 51. Takeda K, Arase S, Takahashi S. Side effects of topical corticosteroids and their preventions. Drugs. 1988;36 (Suppl 5):15-23. 52. Friedman SJ, Butler DF, Pittelkow MR. Perilesional linear atrophy and hypopigmentation after intralesional corticosteroid therapy. Report of two cases and review of the literature. J Am Acad Dermatol 1988;19:537-41. 53. Colomb D. Stellate spontaneous pseudoscars. Senile and presenile forms: Especially those forms caused by prolonged corticoid therapy. Arch Dermatol 1972;105:551-4. 54. Katz HI. Topical corticosteroids. Dermatol Clin 1995;13:805-15. 55. Keipert JA, Kelly R. Temporary Cushing's syndrome from percutaneous absorption of betamethsone 17-valerate. Med J Aust 1971;1:542-4. 56. Gilbertson EO, Spellman MC, Piacquadio DJ, Mulford MI. Super potent topical corticosteroid use associated with adrenal suppression: Clinical considerations. J Am Acad Dermatol 1998;38(2 Pt 2):318-21. 57. Ohman EM, Rogers S, Meenan FO. Mckenna TJ. Adrenal suppression following low-dose topical clobetasol propionate. J R Soc Med 1987;80:422-4. 58. Munro DD. The effect of percutaneously absorbed steroids on hypothalamic-pituitary-adrenal function after intensive use in in-patients. Br J Dermatol 1976;94 (Suppl 12):67-76. 59. Schacke H, Schottelius A, Docke WD, Strehlke P, Jaroch S, Schemes N, et al. Dissociation of transactivation from transrepression by a selective glucocorticoid receptor agonist leads to separation of therapeutic effects from side effects. Proc Natl Acad Sci U S A 2004;101:227-32. 60. Singh G, Singh PK. Tachyphylaxis to topical steroid measured by histamine-induced wheal suppression. Int J Dermatol 1986;25:325-6. 61. Miller JJ, Roling D, Guzzo C. Failure to demonstrate therapeutic tachyphylaxis to topically applied steroids in patients with psoriasis. J Am Acad Dermatol 1999;41:546-9. 62. Scheuer E, Warshaw E. Allergy to corticosteroids: Update and review of epidemiology, clinical characteristics, and structural cross reactivity. Am J Contact Dermat 2003;14:179-87. 63. Dooms-Goossens A, Morren M. Results of routine patch testing with corticosteroid series in 2073 patients. Contact Dermatitis 1992;26:182-91. 64. Bircher AJ, Thurlimann W, Hunziker T, Pasche-Koo F, Hunziker N, Perrenoud D, et al. Contact hypersensitivity to corticosteroids in routine patch test patients. A multi-centre study of the Swiss Contact Dermatitis Research Group. Dermatology 1995;191:109-14. 65. Lutz ME, el-Azhary RA. Allergic contact dermatitis due to topical application of corticosteroids. Review and clinical implications. Mayo Clin Proc 1997;72:1141-4. 66. Isakisson M, Andersen KE, Brandao FM, Bruynzeel DP, Bruz M, Camarasa JG, et al. Patch testing with corticosteroid mixes in Europe. A multicentre study of the EECDRG. Contact Dermatitis 2000;42:27-35. 67. Thompson KF, Wilkinson SM, Powell S, Back MH. The prevalence of corticosteroid allergy in two U.K. centres: Prescribing implications. Br J Dermatol 1999;141:863-6. 68. Rapaport MJ, Rapaport VH. Serum nitric oxide level in "red" patients: Separating cortico-steroid-addicted patients from those with chronic eczema. Arch Dermatol 2004;140:1013-4. 69. Saraswat A. Topical corticosteroid use in children: Adverse effects and how to minimize them. Indian J Dermatol Venereol Leprol 2010;76:225-8. 70. Feldmann RJ, Maibach HI. Regional variation in percutaneous penetration of 14C cortisol in man. J Invest Dermatol 1967;48:181-3. 71. Bewley A. Expert consensus: Time for a change in the way we advise our patients to use corticosteroids. Br J Dermatol 2008;158:917-20. Epub 2008 Feb 22. What is new? 1. Abuse or misuse of TC becoming a great cause concern due to their dramatic clinical effects, peer pressure to use them for cosmetic purpose, easy availability of products, inadequate information of their adverse effects, and phenomenon of steroid addiction. 2. TCIRD, TSDF newly defined TC-specific adverse effects. 3. Attempts are ongoing to develop the ideal TC having increased potency without significant adverse effects. Esterification found to improve the safety profile. 4. Evidence-based studies suggest once daily application at par with more frequent applications even in the cases of conventional TC. Weekend or pulse therapy with TC prevents tachyphylaxis. 5. Intervention to prevent steroid addiction, misuse, or abuse has to be multidimensional. Rathod, S.S., Motghare, V.M., Deshmukh, V.S., (...), Bhamare, C.G., Patil, J.R.